‘Love’ and ‘Confession of Love’ might be just one phase in some stories but for others these two phrases are two different stories. If you find the lacuna familiar then you have caught hold of the correct review before making a purchase. People do fall in love and the most difficult development in this divine process is confessing your love to your beloved. There is no set procedure or protocol to it; you just need to work upon it. This story is woven around one such confession. Two hearts come together, hear each other’s heart beats but they are destined to tread along different paths. Nevertheless, they meet again and what echoes is just pure, serene divine message of love. To start with, the first half didn’t seem to be captivating enough but as the second half approaches an undercurrent could be felt. The storyline is very captivating and it becomes difficult to keep the book down. Your senses start working in tandem in order to find out what lies in there for them? I have read the author’s previous works as well but this is the most sensitive and sentimental one. A story that will tear you and leave you longing for more – longing for love, more. 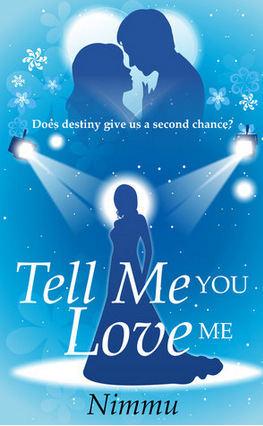 You long to be loved, to be in the arms of the love of your life yelling – “Tell me that you love me”. The feeling of love has different interpretations for all authors. Only a few authors have the acumen to take up the challenge of weaving a story that is immortal yet which is buried deep into the hearts. Nimmu has that knack which touches the chords and strikes the right notes. Sometimes, her writing might not be felt like those written with polished vernaculars but her strength is that rustic feel which every single story from her pen imparts. Her characters are easily relatable and instantly connecting, as always. Her attention to detail is impressive. The depth with which she describes the scene is captivating. This story has hues of bollywood type romances but she has done justice to her part. She is successful in transcending the very essence of the story into the reader’s minds. Why I didn’t include heart here? Well, this is because it might be busy in telling and hearing after completing the book. Listen, what it says. If I chose to write a one line review or verdict for this book, it will be: It teaches you to RESPECT your love! Memories of the heart are deeper than the logics of the mind. Trisha the girl next door was everything Rishab ever wanted in a girl. But for Trisha, Rishab was her best friend and wanted to keep it that way because love meant losing her freedom. Rishab hopes to make Trisha realize that true love never binds you but sets you free. Will Trisha realize it before it is too late? Will destiny give her a second chance to tell him those magical words that Rishab had waited to hear? Very interesting Character Raveena, the modern “Desi” American. Description of IndoAmerican wedding, the South Indian Tambram style, was particularly well done and witty.